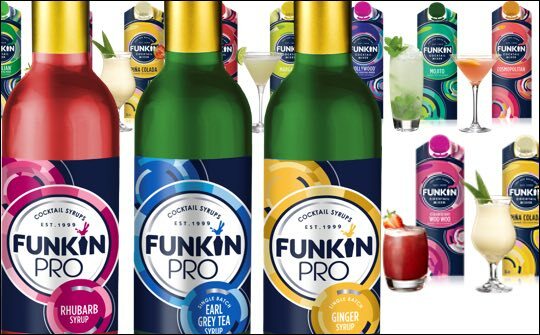 Funkin is introducing new packaging across its expanding range of products including cocktail mixers, fruit purées and syrups. The packaging will roll out across the portfolio in the coming months creating a unified look that will make it unmistakably recognisable across the on- and off-trade. Celebrating 15 years of successful growth, Funkin has remained a leader through the cocktail revolution and its sophisticated and stylish packaging reflects that evolution with a premium design that will elevate brand awareness and sit perfectly alongside spirits on the shelf. On a rich navy blue background sits the new bright white Funkin logo with the brand’s signature red splash now a swirl to represent a top-down view of a cocktail glass. The swirl creatively leads the eye to the side of the package where the #FunkinFast method is clearly communicated in three steps—Ice In, Spirit In, Funkin! The navy background is designed to evoke the evening drinking occasion for cocktails while the contrasting bright colours on the package speak to Funkin’s vibrant, fresh fruit flavours, great for creating delicious and fun cocktails. The new packaging has been approved by consumers with survey findings revealing that an overwhelming 95% say the package effectively communicates how to use Funkin. In the off-trade, each cocktail mixer package educates consumers on how to make their favourite cocktails at home with three simple steps. On the 750ml packs, consumers can choose from a selection of popular cocktails and find serving tips directly on the pack making high-quality cocktails in the setting of their own home. On the 1L packs, on-trade customers can also find tips on how to best serve Funkin’s popular cocktails including a Mojito, Strawberry Daiquiri and Piña Colada making it easy to create consistent quality, great tasting drinks. Building on its loyal bartender following in the on-trade, Funkin will also have a unified look across its Pro range of purées and syrups. The new packaging reflects the freshness of the product, reinforcing Funkin’s premium quality position in the market. Funkin senior brand manager Joana Lenkova says: “Break through innovation is in the DNA of everything we do. We are very passionate about our brand and with this new design we ensure that Funkin looks as good as it tastes!